R.J. Case, a 2013 graduate of Ole Miss, started “Mesa de Español,” a Spanish-speaking group at University of Mississippi Medical Center in Jackson, as a tribute to his experience as a biochemistry and Spanish student at Ole Miss. He said what made his experience here so unique was El Café de Los Lunes, a group led by professor Irene Kaufmann. “The skills I learned there have helped me serve my patients well in medical school and have even made the difference between life and death,” Case said. Case cherishes every Monday afternoon he spent at the Honors College — still a time when the kitchen becomes loud with conversations that most students don’t comprehend. These conversations have occurred on campus every week during the school year for almost 13 years. According to the College of Liberal Arts website, the conversations began in 2006 when Irene Kaufmann, lecturer of Spanish at Ole Miss, and a few of her students were looking for opportunities to practice their Spanish outside of class. After seeing an increase in interest from new students, the meeting started to occur weekly. Kaufmann said El Café de Los Lunes serves as a place for people of all ages and fluency levels to practice speaking Spanish. Eight to 15 students usually meet on Mondays, and there are 206 members in the closed Facebook group where Kaufmann gives announcements for El Café. Kaufmann has taught at the university since 2001. Last year, she was awarded the College of Liberal Arts Outstanding Instructor of the Year. William Bradford, a sophomore international studies major, was born in Peru but moved to the United States when he was 10 years old. Bradford said that the club has helped him prepare for his study abroad trip to Montevideo, Uruguay. “Once I started going (to El Café), I learned it was the best way to improve my Spanish before I go abroad,” he said. In addition to studying abroad, Kaufmann mentioned other possible opportunities that students learning Spanish can take. St. Peter’s is one of few churches in Oxford with a Spanish service, which takes place there at 6 p.m. on Sundays. El Café has grown into the community. 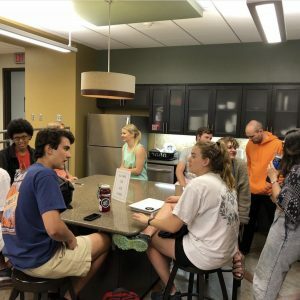 According to Kaufmann, the group goes out to eat together at least twice a semester now and has added conversations at Uptown Coffee on Wednesdays. This began earlier this academic year to encourage more Spanish speakers in the community, not just students, to join. “When you speak a different language, you’re a better person because you can put yourself in other people’s shoes and you learn to respect and enjoy and appreciate what you have,” Kaufmann said. The program has changed significantly in its 13 years. El Café has been very important and special to many students, and it grows their appreciation for language. Adrianna Siebenaler, a junior integrated marketing communications major, said that her time in the club has helped her develop an appreciation for other cultures and a desire to connect with them.